First, to my regular readers, I apologize for my inability to bring my writing to you lately, but the combination of working two jobs and the physical ailments that hit us all as we grow older, have left me unable to share my gift with you 'til now. The one-two combo of this upcoming improbable and impending election — as well as my new position as reader and host of a monthly poetry slam, has helped me to pen two poems; the first, a silly satire with serious undertones, the second, quite serious from the start — deadly serious one might say. While I wish you were all at my poetry slam to hear me recite in person, I hope that even at home you can hear my voice — and His — through them. Pro-Life Action League Truth Tour, Elmhurst, IL. Photo by Jeanette O'Toole Photography. Tom O'Toole hosts "The Friendly Poetry Slam" every third Sunday at 6:00 p.m. at Josephine's Martini & Wine Bar, 207 S Villa Ave, Villa Park, IL. These poems will be read at the Oct.16th slam (which also happens to be the 100th anniversary of the founding of Planned Parenthood). "Onward Notre Dame: A New Beginning" (which debuted on April 14th on NBC Sports Network) posed as a mere half-hour preview show for the 2015 Fighting Irish football team, but it unintentionally summed up all that is good (Our Lady) and bad (nearly everything else) at this crucial "Crossroads" time in the University's checkered history. On the positive side, "Onward" talked about the great power that Mary's intercession can have for the team and the school more openly than on any show since the Lou Holtz era. On the negative, the participants in the TV special attributed most of this greatness to the policies of the recently departed "Fr. 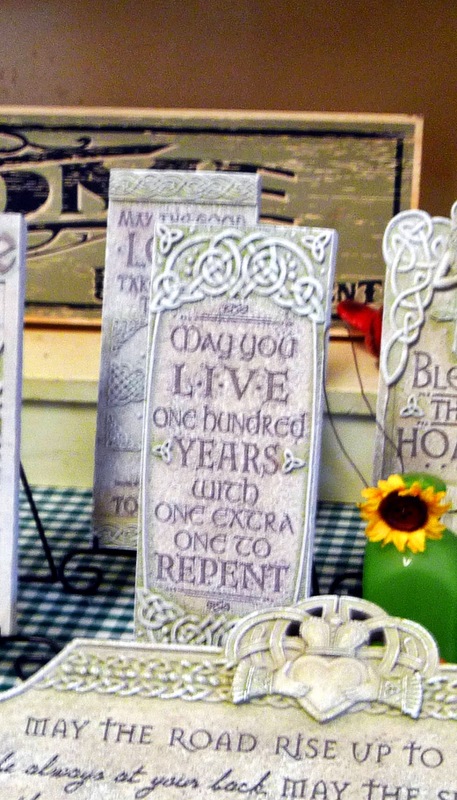 Ted," changes that did more to devour (Rev. 12, 1-7) devotion to Our Lady than promote it. But, at least for Her hard-of-hearing sons and daughters, Our Lady seems to have had the last laugh, which I will now share with those who can still hear, in the hope they will now take it to heart. The special opened with a scene from Fr. Hesburgh's funeral and several shots of "Fr. Ted" stickers being stuck on helmets and similar patches sewn onto uniforms, by decree of Notre Dame athletic director, Jack Swarbrick. As expected, the show's obligatory tribute to Hesburgh's myriad secular accomplishments that then followed omitted any reference to his disastrous "Land O'Lakes" document, and indeed most of the documentary's participants seemed oblivious to the damage this decision caused. Fortunately, the preview then turned to what is (and hopefully, will always be) Notre Dame's better side, as aptly named current Notre Dame player, Jarrett Grace, detailed how his Catholic faith helped him overcome doubts and persevere through a grueling year-and-a-half rehab from a severe leg injury to finally play for the Irish again, and later showed the equally poignant return of former Notre Dame All-American and NFL standout, Todd Lyght, to the Fighting Irish coaching staff. 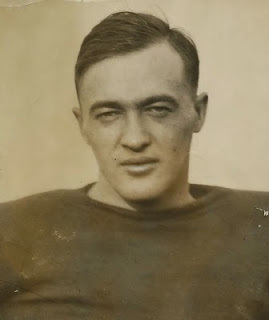 Despite his many accomplishments and comparatively small coaching role here, the humble Lyght felt blessed to be back at Notre Dame, where he could resume his frequent trips to the grotto, which sustained him as a student/athlete and would now strengthen him as a mentor. But then, at least for those who watch TV with subtitles, the special then takes an unexpected turn. With my wife being severely hard of hearing, and my own hearing getting worse by the year, I've gotten used to subtitles, with the added advantage (that my wife doesn't have) of usually being able to catch when the titles are inaccurate. But as the show closed with a surprisingly powerful tribute to Our Lady by both Swarbrick and Coach Brian Kelly (who trotted out Holtz's classic line that God doesn't care whether or not Notre Dame wins, but Our Lady does) I longed for this Marian devotion to be divorced from the mindless praise of Hesburgh—and then the following line (see picture) appeared. 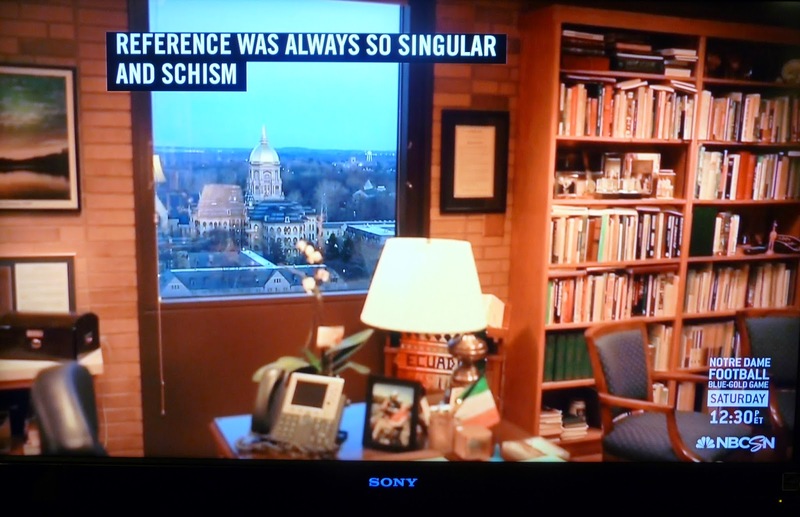 Swarbrick's actual line about Hesburgh was that Fr. Ted was so successful because his frame of reference was "always so singular and simple," but no "mistake" could have better summed up the truth. Whether it was the work of a devout Domer closed-captioner, the Holy Spirit, or merely a "coincidence" (ironically, Coach Kelly just got through saying he firmly believed even Notre Dame's losses happened for a reason) it accomplished its purpose. Ever since my first article on Notre Dame's fall from Faith, written shortly after my graduation from the University in 1981, detailed how Hesburgh's hiring of Fr. 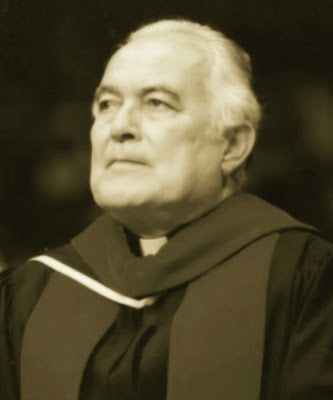 Richard McBrien (and his theologian's "alternative magisterium") would lead to schism (with McBrien being named the first pope of the American "Catholic" Church) Hesburgh's vision of separation from Rome has led Notre Dame closer and closer to the edge of the cliff. With only Mary and a few lay faithful such as the late Charles Rice (a true Notre Dame hero) and Michael Voris holding her back, Notre Dame's decent onto total darkness seemed inevitable. But after watching this perhaps unintentional network tribute to Mary, I wonder if people are finally listening. Maybe Hesburgh's death made some folks realize that no one, not even the ever-present Fr. Ted, lives (at Notre Dame) forever. Maybe his passing is that of a great grey shadow, and, with the Son now out again, new voices will emerge to "Wake up the echoes cheering Her name." For if the many Notre Dame and Fighting Irish fans finally realize Hesburgh's folly, and look upon those misguided patches with prayers for Father Ted's immortal soul instead of praise for his earthly accomplishments, Father Hesburgh's felix culpa could actually make Notre Dame stronger than ever, in Faith if not football. Still, I have the feeling that if Her loyal sons take care of the first thing, Our Lady will take care of the rest.